‘The Saint’s Blessing’ (8.5 x 5.5cm) by Bireswar Sen. Barely larger than a visiting card, Bireswar Sen’s paintings have the majesty and power to inspire awe the way a large canvas can. The sweeping panoramas of mountains and landscapes are confined within such a small space that for a moment one forgets it’s a painting. Ignore the surrounding frame and it feels like you’re peering down another world through a keyhole, with overwhelming vistas stretching into the distance. The breathtaking watercolours form part of an ongoing exhibition, Reflections: Man And Nature In The Paintings Of Bireswar Sen, at the National Gallery of Modern Art in Delhi, running till 30 November. Born in 1897 in Kolkata, Sen trained for six years under two towering Indian modernists, Abanindranath Tagore and Nandalal Bose. Tagore’s ideology emphasizing indigenous techniques in painting over Western influences, formed the bedrock of the Bengal School art movement and influenced Sen’s own work. According to Sen’s grandson Prithviswar Sen, a trustee of the Bireswar Sen Family Trust, “he also got the chance to learn the wash technique from a visiting Japanese artist, Kampo Arai." But a turning point in Sen’s life was his encounter with Nicholas Roerich, a Russian painter and writer whose interests ranged from mysticism, theosophy and archaeology to pacifism and Hindu philosophy. It was in 1932 that Sen first met Roerich in Naggar, a small village in Himachal Pradesh that Roerich had made his final home. The Russian artist’s works depicting nature and the Himalayas, informed by his mystical sensibility and spiritual approach, made a deep impact on the young Indian artist. While Roerich’s work was mostly executed on larger canvases, Sen decided to paint the Himalayas in a highly original way: through miniatures small enough to be held in the palm of one’s hand. The Indian artist made countless mountain journeys, but the nature-inspired miniatures were produced in his mundane Lucknow studio, “entirely from memory and imagination", recalls Prithviswar. The arresting quality of his miniatures echoed what Roerich himself achieved in hypnotic works like Star Of The Hero (pictured). Both zealously communed with nature through their lone, monkish figures set against unforgiving wintry landscapes; human figures dwarfed by desolate rocks or a distant fire flickering in the vastness of the night. “Great is Roerich and greater still are his works," Sen wrote in his diary. But once he devoted himself to miniatures after their meeting, the flow of inspiration was probably two-way. Roerich came to cherish Sen’s work, writing in a 1935 letter, “I feel sure that you will carry high the Torch of Art…only devotion to the Highest, to Art and Creativeness can carry us to the Blessed Shore". 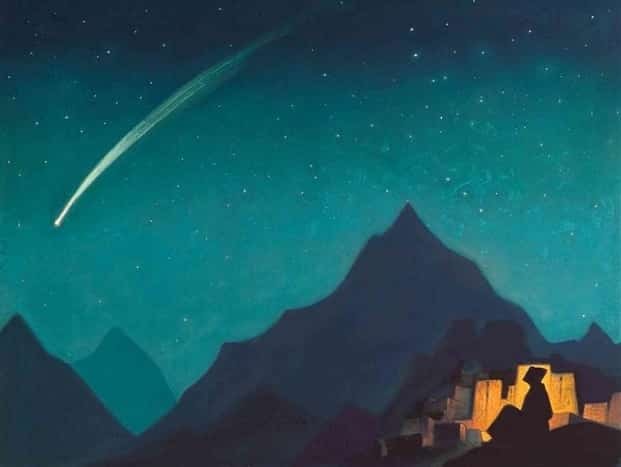 Sensing the changing winds a mere four years before World War II, Roerich felt “such torches" were much needed in a world mired in turmoil, having heard “many sad stories of misery and unhappiness" during his travels. In The Saint’s Blessing (pictured), Sen poignantly captures this redemptive sentiment. He plants the viewer at the deep end of an icy cave looking out towards a vast landscape. At the cave opening, a saint—in actual size, no larger than a grain of rice—extends his arm to bless a seated figure. The harshness of the environment is softened somewhat by the human company of a holy saint, his comforting gesture exuding warmth. We might be distant observers of the unfolding scene, but salvation seems just around the corner. Roerich, whose 70th death anniversary falls next month, believed that only “in the boundless art, the state of human consciousness can best be observed", while for Sen the purpose of art was not to imitate nature, but capture “the quintessence of the scene" by recording one’s innermost response. They were kindred spirits, attuned more to the numinous than the earthly, for whom transcendent peace lay only in the creative realm. In a fleeting world marked by grief and suffering, art held for them the promise of eternity.